Mountaineering watches aren’t just good for trekking or scaling the side of mountains. Many mountain watches are also great for casual use. 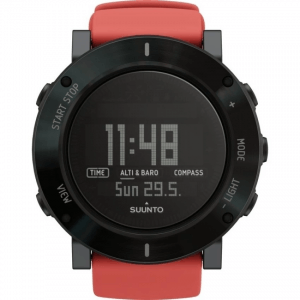 Suunto, Seiko, Garmin, and Casio are just a few of the many brands that create timepieces fit for both outdoor and indoor use. 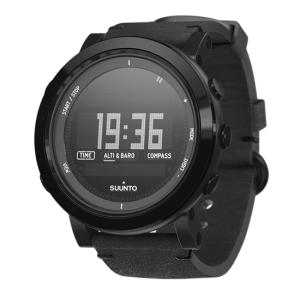 Wearing a mountain watch lets users take advantage of different specialized features like an altimeter and GPS tracking. In this page, we’re going to introduce our top recommended mountaineering watches in a ranking format. Check out our list for you to select the right mountain wristwatch for your personal preferences and needs. Selecting a mountain watch is different than looking at the market for a traditional wristwatch. Checking out key features, for example: functions that measure for altitude, temperature, distance, atmospheric pressure, and of course, the current time. All of these functions allow you to choose the ideal watch for mountaineering, trekking, and even when you’re just going for a night in the town. Keep in mind you’re going to wear the watch for extended periods of time. So you’ll have to select a mountaineering wristwatch that’s both light and comfortable. However, there are some watches packed with several features that you may plan on purchasing. Just bear in mind that some wrist watches tend to be heavier than others because of the additional features. With a waterproof feature, you don’t have to remove your watch when you’re trying to wash your hands. Aside from that, you don’t have to fret about the wristwatch getting broken in case of rain. Water resistance can be measured against indicators such as water depth measured in “m (meters)”, and a pressure measured in “ATM (atmospheric pressure)”. For example, watches which have a resistance of 3 ATM or 30m, are fine when exposed to light rain or washing your hands while wearing it. At a resistance of 10 ATM or 100m, it can withstand showers as well as swimming and snorkeling. Hence, it is recommended for river activities or prolonged walks in the rain. There are generally three types of power supply you can choose when selecting mountaineering watches. These power supplies are as following: battery type, solar-type, and automatic winding type. Solar-powered watches are great because you don’t have to worry about the battery draining while you’re out in the woods or a mountain. However, you may have a problem if it’s not sunny. Watches with an automatic winding power supply are safe because it doesn’t cut the supply of power from the battery. Lastly, wristwatches that only rely on battery power will stop once the “juice” inside the battery runs out. 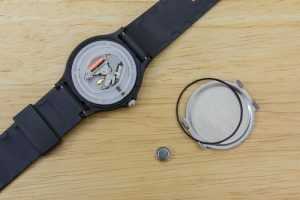 If you’re worried that the battery will run out while you’re out on a trek, then you should charge or replace the batteries on your watch before you head out to your outdoor adventure. Looking for a mountaineering watch means that you should look for a model with the following primary features: altimeter, barometer, and electronic compass. Other models will have additional features like an accelerometer, thermometer, heart rate monitor, alarm, and even a counter that displays how much calories you’ve burnt. The more features that watch has, the more pleasant it’ll be, especially if you’re an individual who likes the great outdoors. However, it’s still very important to master these functionalities to make full use of the device. However, among the many features that a mountaineering watch may have, perhaps the most important functionality you should be looking for is GPS. It collects the correct time, date, and location, which helps you keep tabs on your exact position so you won’t get lost during your trek and you can check the rout that you walked after trekking. Watch displays are generally found under two major categories: analog and digital. 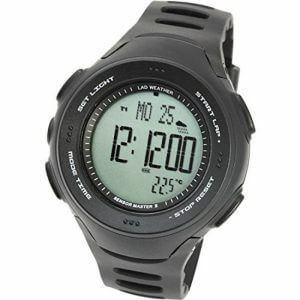 Digital watches tend to have altimeters and electronic compasses. Analog wristwatches, on the other hand, may still have some of the key features for trekking and mountaineering, but it won’t be as extensive as their digital counterparts. Wristwatches will either have silicon, nylon, or rubber for its band material. Silicon is a highly waterproof material, and it’s also lightweight and durable. However, some people might get allergic reactions from it. Good alternatives to silicon would be nylon. From this point, we’re going to introduce our top recommended mountain watches in a ranking format. Check out our list to find your preferred mountaineering wristwatch. Some people aren’t looking for a watch just for mountaineering or trekking. If you’re a sporty individual who loves the great outdoors as you love mountaineering, then you should check out this watch. You don’t have to worry about running out of battery during an outdoor adventure with its solar-powered battery. This wristwatch has features like four daily alarms, a countdown timer, a power-saving function, digital compass, thermometer, barometer, and multiple sensors. It’s even waterproof up to 100 meters of underwater depth. Hence, this watch is also ideal for snorkeling and swimming, but it’s still not a good choice for scuba diving. However, its backlight isn’t the brightest in the bunch. You may have some problem looking at the display under direct sunlight. On the plus side, at least you don’t have to temporarily blind people inside a dark cinema when you just want to check the current time. 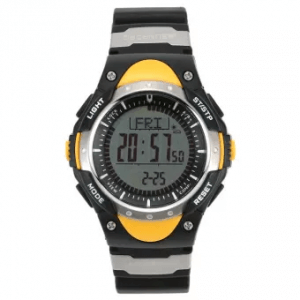 This watch has important features like an altimeter, thermometer, barometer, and digital compass. This wristwatch can even help predict the weather. So if you’re planning to go on a hiking trip and you want to check the weather for tomorrow, you can just check the readings brought to you by this watch. The list of features doesn’t stop there because this watch can also record steps, distance, and calories burned. It’s also 3 ATM waterproof, and there’s a battery level reminder so that you’re always on the know when you need to replace its CR2032 battery. All of these features are found in a budget-friendly model that won’t hurt your bank account. However, the quality of the watch does justify its price. Try to hold it in your hand, and you can “feel” that it has a reasonably cheap offering from the touch. Still, if you’re in a tight budget but still want a watch you can bring for your next trek, this might be the next item on your shopping list. 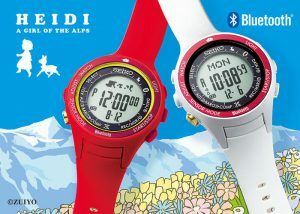 This wristwatch isn’t just great for mountaineering, it’s also ideal for when you just have to buy groceries. It’s durable, high-quality, and fashionable in just about every way you look at it. 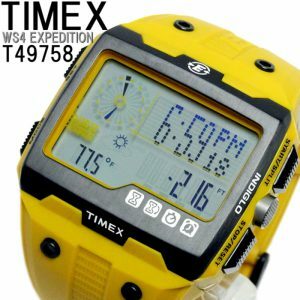 You can use this watch for trekking, walking, backpacking, hiking, mountaineering, and everyday use. It has Sapphire Crystal Glass watch face, which is scratch-resistant with excellent hardness and durability. The material for the display also gets rid of glare so you can easily take a look at what’s on the display even under harsh lighting conditions. You’ll find core mountaineering features in the Essential like an altimeter, barometer, and a digital compass. However, some people might just slowly back away once they take a look at its price tag. If you don’t mind spending the extra cash, and you want to flaunt your wrist while you’re on your outdoor adventure, then this product is for you. 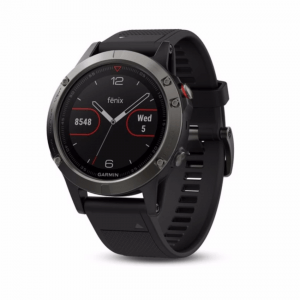 Most mountain climbing wristwatches require you to wirelessly connect it to a mobile device just for you to view your location on a map. However, this product takes one step out of the process. Wear this wristwatch and you can see your exact location through an onscreen map. It also has all the features you need for trekking and mountaineering such as a waterproof design that can withstand 50 meters of being underwater and a comprehensive support for different activities. You can also take advantage of its touchscreen display for easy accessibility. However, for some people, the extra features just make the watch bulkier and heavier than other similar products. 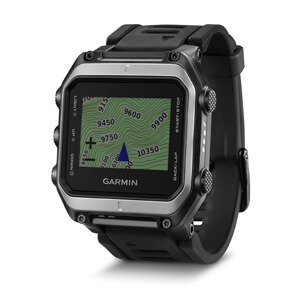 This model is a great choice for anyone looking for a GPS-integrated watch with a great mapping system. New users may find the map feature to be something to get used to because of the small texts and images. There’s a zoom function that you can use, but some users might still want to use a magnifying glass if you have trouble looking at the map from the watch’s screen. One look at this product, and you’ll know that it can take more than just a few bumps and scrapes. Make no mistake because this watch is built to last. Reports coming from verified purchases indicate that buyers use this watch for more than 5 years. It packs a round stainless steel case which assures that you’re going to wear this watch on your wrist for a very, very long time. The Pathfinder also comes with the essentials for mountaineering like an altimeter, thermometer, digital compass, and barometer. However, it does have an expensive price tag. Some people might not be too keen about its price considering that it doesn’t have a lot of features on offer. 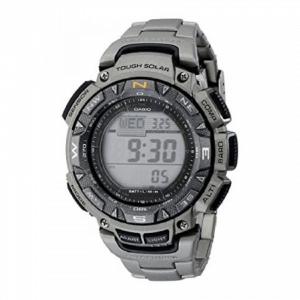 Nonetheless, if you want a highly durable mountain climbing and trekking watch, then this is it. If there’s one thing that some people might not like about this mountain watch, it’s the lack of GPS. 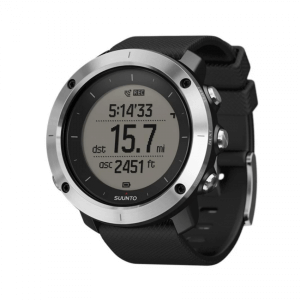 It does, however, come with a 30-meter water resistance, thermometer, altimeter, digital compass, and barometer. There’s also a depth meter for users who bring this watch during their snorkeling expeditions. Its barometer is exceptionally good since it allows you to check for weather changes through a graph on the screen. Aside from its barometer, this watch is also good if you’re looking for a model with a simple design. The watch’s straightforward design also means you don’t have to deal with seemingly complicated controls. One unique feature of this product is its display because it shows white text on a black background. While it’s a good design choice, it does make for poor readability, especially when you’re trying to look at the screen under direct sunlight. 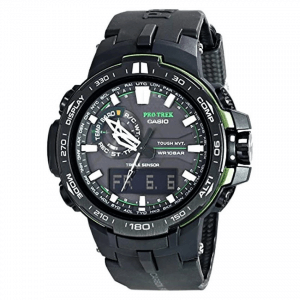 This product is a mountaineering and trekking wristwatch with all the essential features. It has a barometer, altimeter, thermometer, digital compass, and its GPS-enabled as well. Furthermore, its backlight is bright enough that it can act as a flashlight. You can even synchronize this watch with your mobile device through a Bluetooth connection. Accessing all the recorded information is as easy as checking out an accompanying mobile app. The app does come in handy when you’re having trouble looking at the watch’s built-in display under direct sunlight. The brightness on the watch head is good, but not great. The watch can also record daily steps and calories burned. Users who are constantly watching their daily calorie intake can use the features that come along with this watch. People who have daily step goals can also take advantage of its pedometer feature. Some people might immediately buy this product just because of its looks. However, it’s not just your typical watch you wear for date nights because it’s a fully-functional mountaineering wristwatch. 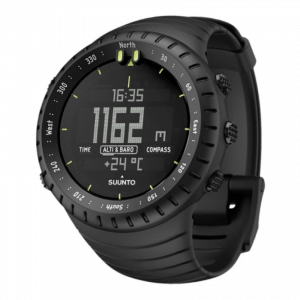 Its list of features includes a triple sensor altimeter, barometer, digital compass, world time, a decently bright LED light, a 100-meter water resistance, a countdown timer, and a power-saving function. You can even recharge its battery through a built-in solar panel. Its 5 daily alarms let you keep up-to-date whenever you need to be reminded about certain events. While the 5 alarms are a useful feature, the sound coming from the watch is mediocre at best. You might have trouble hearing the alarm if you’re inside a noisy place. If you’re looking for an elegant option for mountaineering and for that special night out in town, definitely consider this watch. You can even make use of this wristwatch during fishing trips because of its fishing timer, in which this feature suggests the best times of the day to fish. If you’re looking for a hiking and mountain climbing watch that’s easy to use right from the start, then consider getting this particular mountaineering wristwatch. For one thing, it has an accurate storm alarm that’ll give a very audible sound if there’s a drastic change in atmospheric pressure. 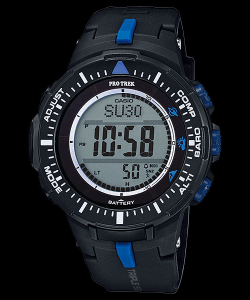 You can access its barometer, digital compass, altimeter, and depth information with its user-friendly controls. Deciding to get this product can mean that you’re not going to buy another mountain watch for a very long while. However, there are some complaints about the band because it feels cheap as compared to the quality of the watch face. Verified customer reviews from sites like Amazon tell of users making use of this watch for over 3 years, and the watch is still holding strong. However, its design definitely screams “Men’s watch.” Hence, female users may want to consider other options. 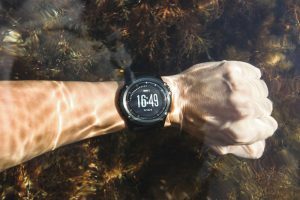 This watch is not just great for mountaineering, hiking, outdoor biking, and trekking, but it’s also an ideal choice for swimming, running, backpacking, and even for everyday use. The band is even replaceable just in case you want to try out other designs. It has all the important functions of a mountaineering watch like an altimeter, thermometer, barometer, and a 3-axis digital compass. The watch’s GPS even lets it automatically set itself, which is important for jet-setters since you don’t have to manually set the time every time you travel to different time zones. This product is a feature-packed, highly-durable, and beautiful-looking watch that you can’t miss. It’s one of the most expensive wristwatches on the market to-date. However, if you want a mountain watch with perfect functions in an excellent looking, why don’t you try this watch! How was our list of recommended mountain climbing watches? Take note that there are mountaineering watches that are both functional and fashionable. You can always go back to our guide whenever you’re looking for a new watch for both casual and outdoor use.